Unicorn Fudge, Unicorn Poop Fudge or Rainbow fudge…call it what you will, but this gorgeous layered white chocolate fudge is as fun to make as it is to eat. 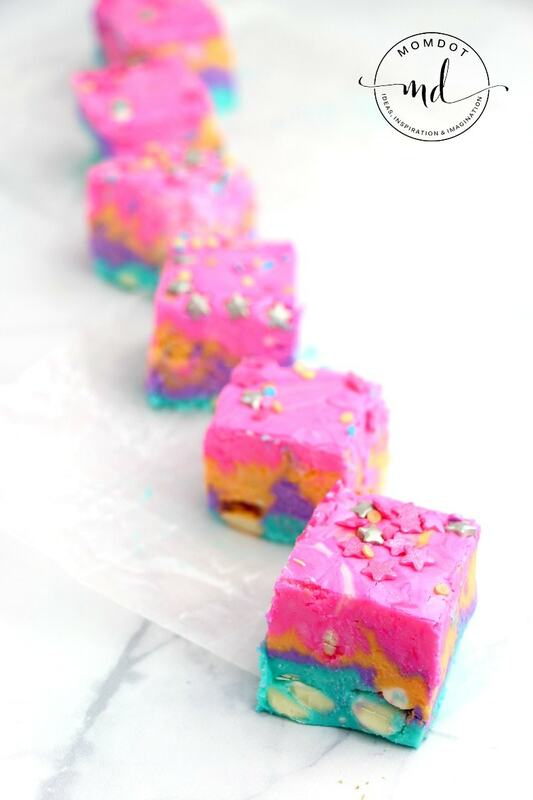 Scroll down to get your unicorn fudge recipe, layered in gorgeous colors, and best recommendations to make as well as a printable recipe version. Unicorn foods and crafts are some of my favorite things. I know its trendy, trust me I know, but the bright colors and neon rainbow effects of the “unicorn” make me happy. That’s probably evident in my unicorn poop muddy buddies, or my unicorn poop no churn ice scream or my unicorn poop cake….just to name a few. I love all things rainbow unicorn (<————you must see this)! Combined with marshmallow cream and white chocolate chips, you can customize your colors quite easily to make the kind of fudge you want for your occasion. When it comes to food dyes, I personally buy Wilton Color Right Performance . I use it in not only colorful food projects but colorful crafts like Unicorn Poop (clear glue) Slime as well. Its worth buying the set because it lasts forever and you can pretty much every color. It POPS better than any other dye I have used. Line a loaf pan with parchment paper and set aside. Place the sugar, butter and cream in a large stockpot and bring to a boil over medium heat, stirring often. Let the mixture come to a boil for 4 minutes (set a timer) and then remove from heat. Immediately stir in the marshmallow cream and white chocolate chips . Grease a 1 cup measuring cup with cooking oil , and then scoop out 1 cup of the fudge mixture. Place it in a small bowl and add a few drops of purple food dye . Stir to completely dye the mixture. Pour the purple fudge mixture into the loaf pan , and then repeat this process to make blue, orange and pink layers. 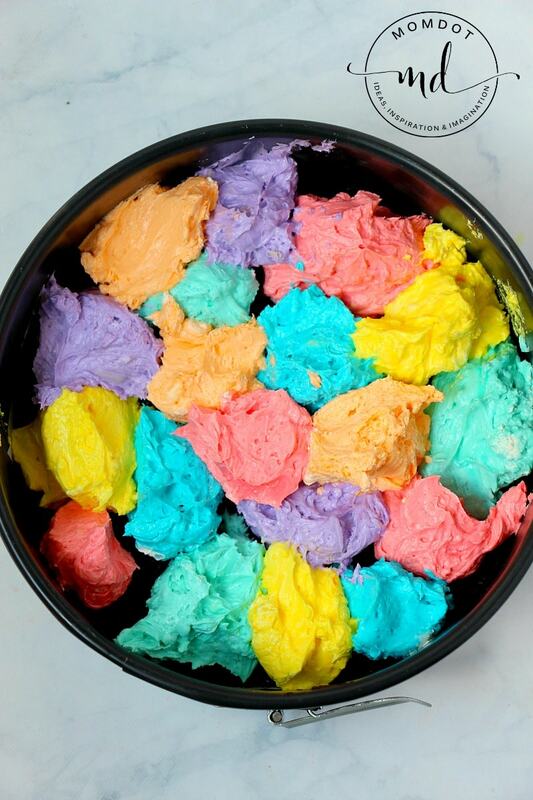 Sprinkle with your favorite unicorn-inspired sprinkles and let set in the fridge for at least 2 hours. Cut into 1″ squares and serve! Immediately stir in the marshmallow cream and white chocolate chips. Grease a 1 cup measuring cup with cooking oil, and then scoop out 1 cup of the fudge mixture. Place it in a small bowl and add a few drops of purple food dye. Stir to completely dye the mixture. Pour the purple fudge mixture into the loaf pan, and then repeat this process to make blue, orange and pink layers. Want another fun dessert? Click below to see what this turns into!